Exploring environmental issues through film, UCLA’s Green Screens Festival will showcase poignant films on diverse environment and sustainability topics. The week long event will also include expert panels featuring prominent researchers and filmmakers. Come join us at the James Bridges Theater on the UCLA campus, April 21st to April 24th, 2015 for a week’s worth of environmental films, events, giveaways, and food! 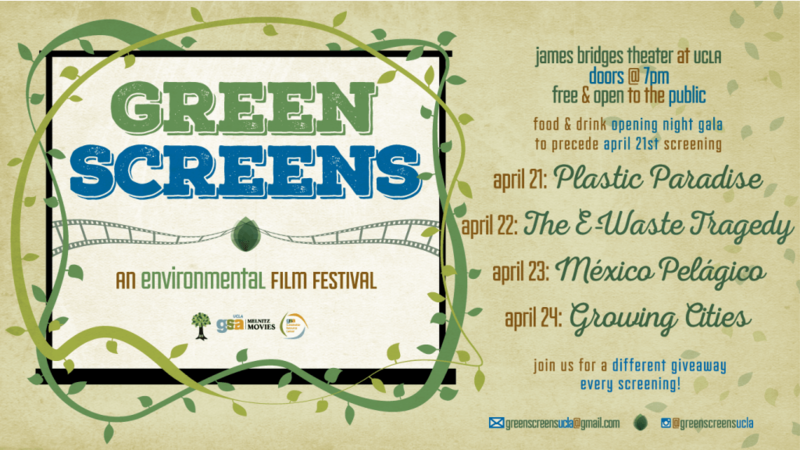 Green Screens Film Festival: Tuesday (April 21st) through Friday (April 24th), James Bridges Theater. Doors open at 7pm. This event is hosted by the GSA Sustainable Resource Center, GSA Melnitz Movies, and E3.